There are many ways to learn how to make easy banana bread recipes. The following are easy recipes to make and are also delicious. Of course the bananas contribute to the moistness of these breads but also the buttermilk and sour cream will also help with moistness and flavor. When you bake these recipes experiment with different type of nuts like black walnuts which adds a lot of flavor. Also you might want to try some with raisins or cranberries for another flavor. How to make easy banana bread recipes? Most of the recipes are easy just because they are “quick breads”. 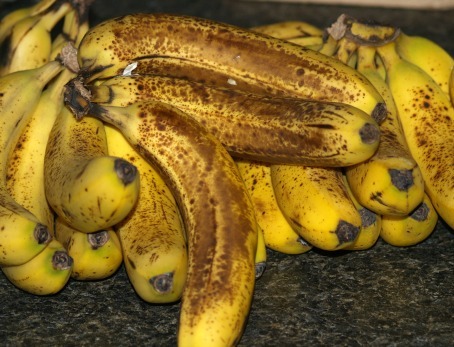 Unlike using yeast as a leavening, most banana breads use baking powder, baking soda or a combination. This type of leavening makes the preparation much easier and quicker. Most of these recipes are easy also because they only require a few basic ingredients. Easy recipes also can be made by using ingredients like self rising flour, biscuit mix and other prepared foods; OR by using a bread making machine. This easy banana bread recipe is delicious with the chopped nuts. Measure and sift flour, soda and salt. Cream butter and sugar together; Add eggs and vanilla and blend well. Stir in mashed bananas. Fold in the dry ingredients and nuts. Dump into a well greased loaf pan. Bake for 55 minutes or until pick comes out clean. Preheat oven to 350F degrees; butter an 8 ½ X 4 ½ inch loaf pan. Cream butter, sugar and egg; cream in vanilla and mashed bananas. Pour batter into prepared pan; bake about 1 hour or until pick comes out clean. This sour cream is a favorite recipe. It is popular for its moistness and rich texture which comes from using sour cream. Grease heavily 1 bread loaf pans. Cream together butter and sugar; beat in eggs one at a time. Mix in bananas, vanilla and sour cream. Combine flour mixture with creamed mixture stirring only until moist. Spoon batter into greased loaf pan. Bake for 60 to 75 minutes until pick comes out clean. This bread is great to make ahead and put in freezer. 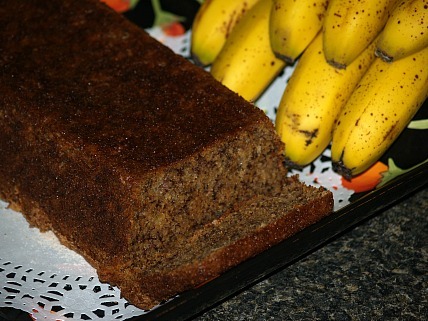 Make easy banana bread recipes using self rising flour. Preheat oven to 350F degrees; grease and flour a large loaf pan (5X9 inches). Combine all ingredients and mix to blend. Spoon batter into prepared pan; bake 45 to 50 minutes until pick comes out clean. Place all ingredients EXCEPT CHOCOLATE CHIPS in bread machine pan in the order recommended by the manufacturer. Add chocolate chips at the “raisin/nut” signal or 5-10 minutes before last kneading cycle. Select Sweet or Basic/White Cycle. Use medium or Light Crust Color. Do not use Delay Cycles. Remove baked bread from pan and cool on wire rack. NOTE: Depending on ripeness of bananas, dough may require more flour than recipes recommends. Five minutes after cycle begins, check consistency of the dough. If dough is not forming a ball and seems wet, add additional flour; 1 tablespoon at a time until soft dough forms. Preheat oven to 325F degrees; grease 8 ½ X4 ½ inch loaf pan. Sift flour, salt and soda together; set aside. Mix bananas, egg and oil together; add sugar. Add dry ingredients and blend; pour into prepared pan. Bake about 1 hour until pick comes out clean.